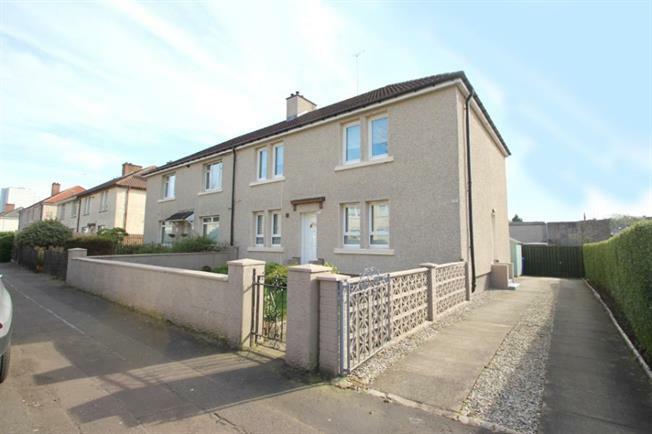 2 Bedroom Upper Floor Flat For Sale in Glasgow for Offers Over £99,000. Immediate internal inspection is of paramount importance to fully appreciate this well proportioned upper cottage flat which offers ideal accommodation for today's young couples and families alike who require to be located within close proximity to a wide range of amenities which include local shops, schools, public transport facilities and easy access to Glasgow and beyond via both motorway and railway networks. The property which has been maintained to the highest of standards by the current vendors comprises entrance hallway, upper landing, spacious lounge, well appointed white gloss style breakfasting kitchen with integrated hob, oven and extractor hood, two double sized bedrooms (both with in built storage cupboards) and refitted converted bathroom offering shower room. The property benefits from large paved driveway via twin wrought iron gates, gas central heating, double glazing and large privately owned garden to rear right of property which is enhanced by paved patio and summerhouse.